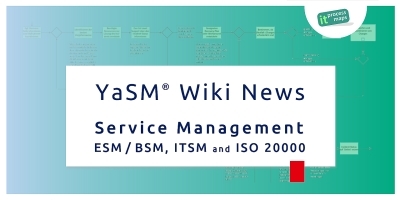 The latest changes and updates to the Service Management Wiki and the YaSM process model. News and videos covering service management, ITSM and ISO 20000. 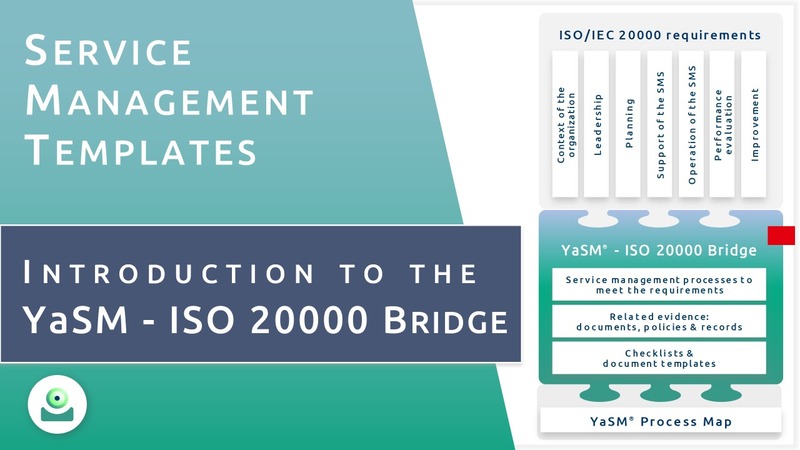 Process models and document templates for every single ISO 20000 requirement: The YaSM - ISO 20000 Bridge makes getting started with the standard a lot easier. The process diagrams and document templates contained in the YaSM model make the huge task of designing ISO/IEC 20000 compliant processes for your organization manageable: A set of detailed diagrams relates the standard's mandatory ISO 20000 requirements to the process diagrams and checklists of the YaSM Process Map. 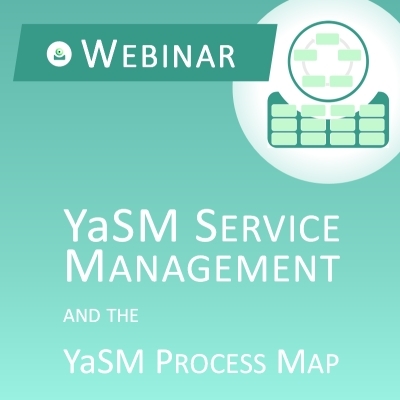 YaSM ('Yet another Service Management Model') is a streamlined and easily understood process model for service management and ISO 20000 that provides ready-to-use templates for your processes and documents. 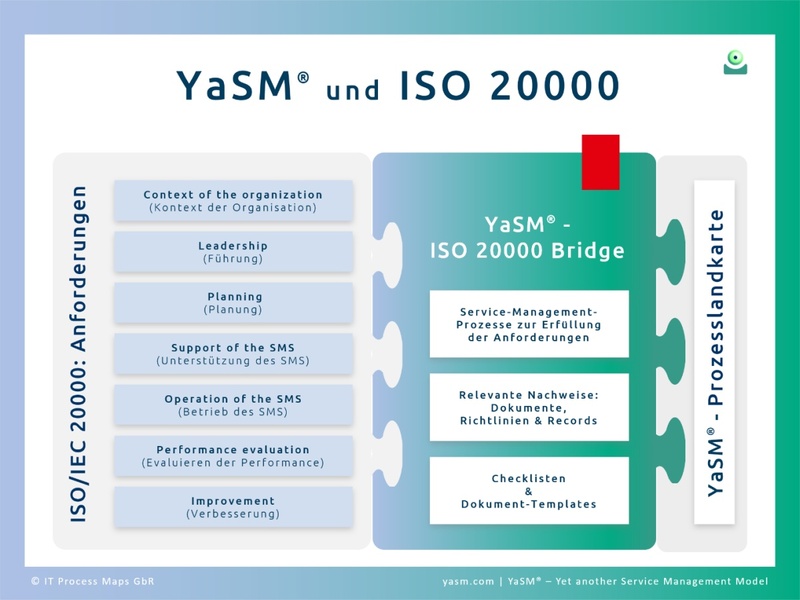 One of the objectives when creating YaSM was to provide a service management process framework which is closely aligned with ISO/IEC 20000 ('ISO 20000'). Frequently, certification according to ISO 20000 is sought because it enables organizations to prove that they are customer-oriented, efficient and effective suppliers of services. The certification can thus be used for marketing purposes, or to gain access to customers and markets which require their service suppliers to be ISO 20000 certified. YaSM consists of a tightly focused set of processes, policies and document templates which provide a solution for every ISO 20000 requirement. 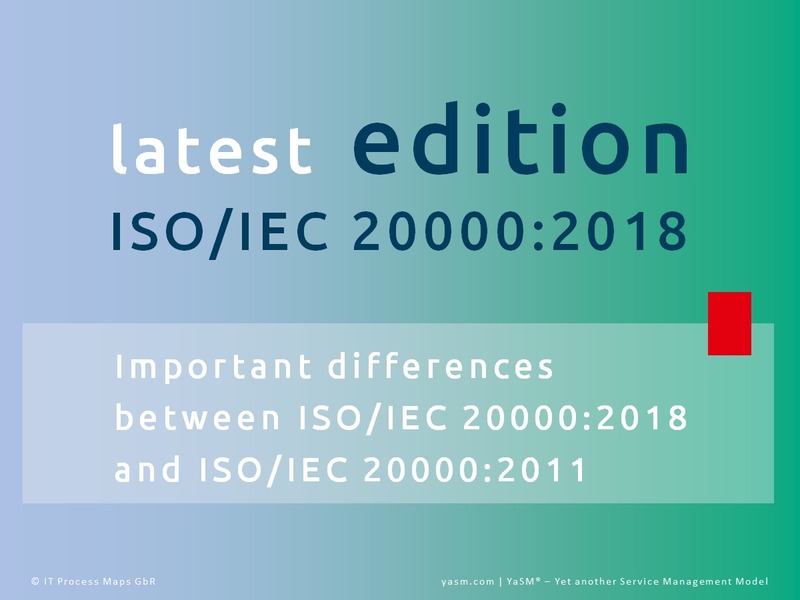 The new version of ISO 20000:2018 is here, and we are currently busy updating the YaSM - ISO 20000 Bridge to bring it in line with this latest edition of the standard. With the update of the ISO 20000 standard, new requirements have been introduced. What is new in ISO 20000:2018? What are the key differences between the latest edition of ISO 20000-1:2018 and the previous 2011 version? 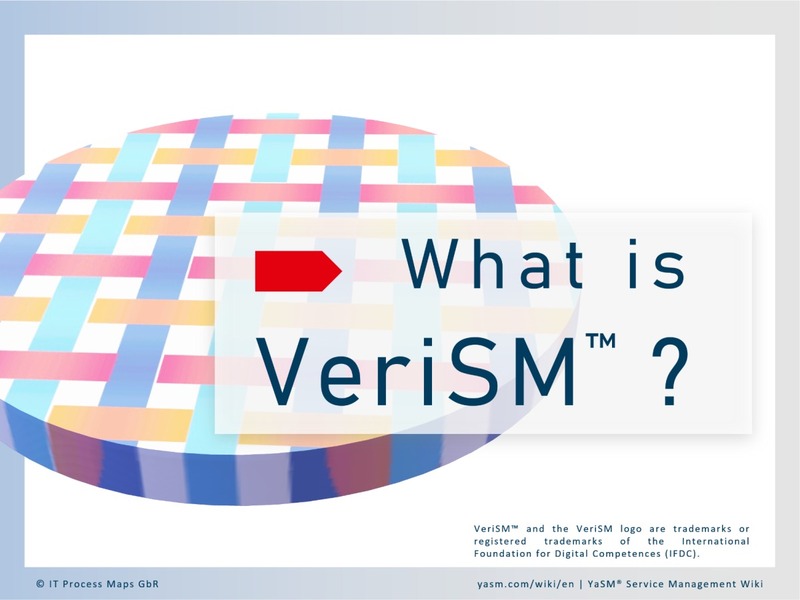 VeriSM™ is aligned with the key principles of established service management frameworks and standards such as ITIL®, COBIT® and ISO 20000. VeriSM does not seek to replace them. Instead it aims to provide the 'glue' to bring the different practices together, so organizations can adopt them in a flexible way. What guidance is contained in this service management approach? A RACI matrix ("responsibility assignment matrix") describes the participation by various roles in completing tasks or deliverables for business processes. RACI models are especially useful in clarifying roles and responsibilities in cross-functional processes. RACI models are especially useful in clarifying roles and responsibilities in cross-functional processes. YaSM is like ITIL®: The YaSM model and the ITIL framework provide advice for managing services - but YaSM is less complex and easier to understand. 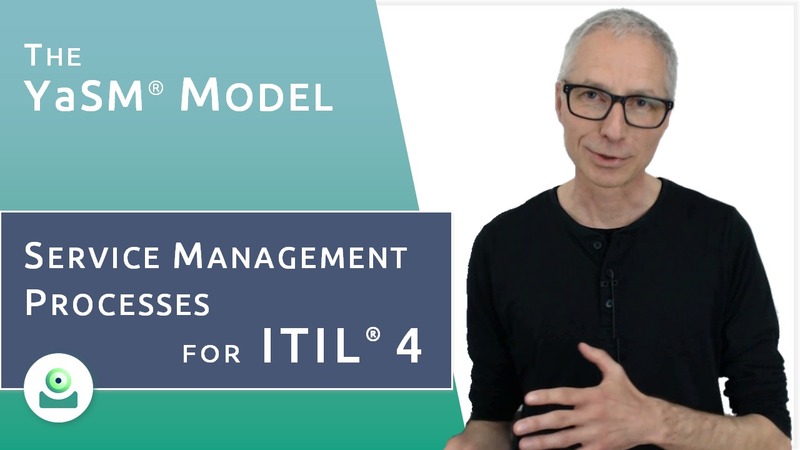 In this video Stefan Kempter gives you a better understanding of the similarities and differences between YaSM and ITIL® by taking you through a couple of examples. He shows you how we managed to create a streamlined process model that is in line with the IT Infrastructure Library® and covers all key aspects of service management best practice. 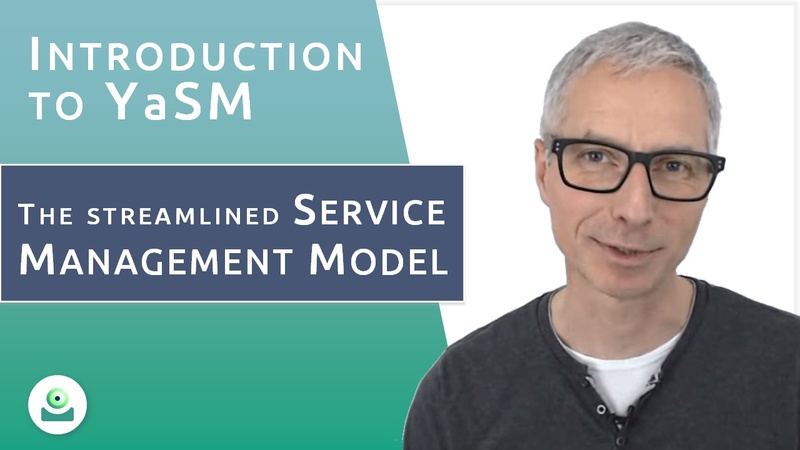 In this video Stefan Kempter explores the roots of enterprise service management in IT service management (ITSM) and explains what it's all about. And he shows how the YaSM framework helps you with introducing the enterprise service management approach in your organization. There have always been a number of time-tested, simple principles in service management that we must get right in order to become successful providers of services. In our videos we explain how you can bring these principles to bear in your organization. If you have any questions or suggestions we are happy to answer them in the YaSM support community! Enterprise service management (ESM) is a growing trend in the service industry but it's not a new invention. In fact, we've been using the ideas behind ESM for decades, but mainly in the field of IT services. 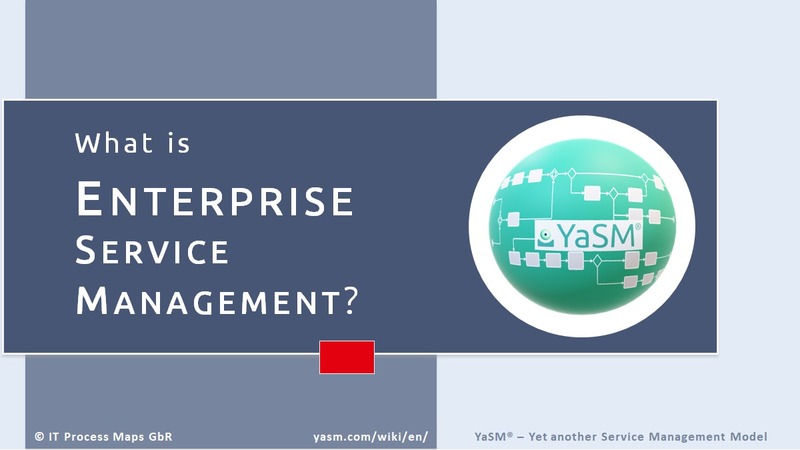 Enterprise service management and YaSM. 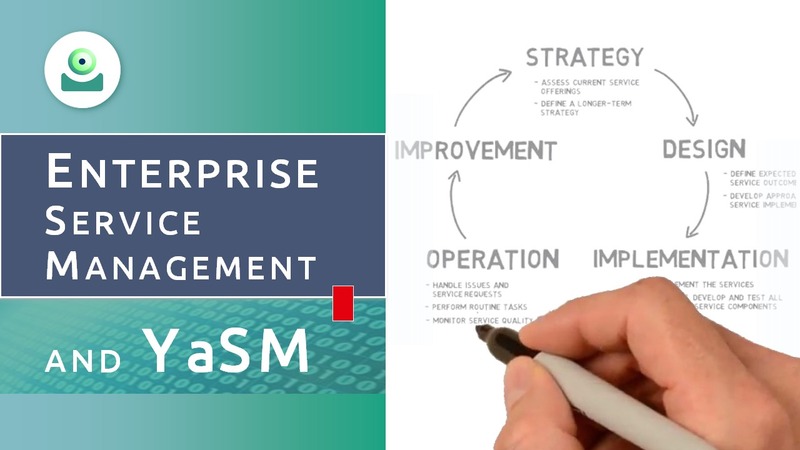 From the YaSM blog: Enterprise service management - an emerging trend. 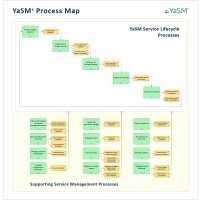 The YaSM® Process Map is a set of process diagrams and document templates for organizations that want to get serious with introducing enterprise service management or ITSM best practice. You can obtain the process model as a set of Visio® diagrams or as a complete ARIS™ process model. All process diagrams and documents are completely editable and can be adapted to the needs of particular organizations. YaSM process templates: The YaSM Process Map. 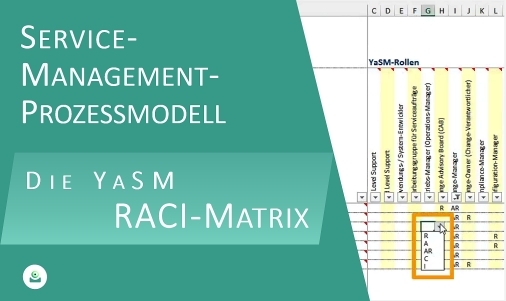 In this short introductory video Stefan Kempter introduces the YaSM Process Map and explains the structure and contents of the YaSM process model. We have just launched our new YaSM support portal where you can search for knowledgebase articles and raise tickets. If you have any questions about YaSM or want to share your insights and thoughts, please head over to the portal and join the discussions in the YaSM community! Enterprise service management (ESM) is gaining traction. Microsoft has recently published the new version of Visio® 2016. 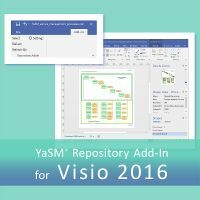 The YaSM® Process Map works very well with this latest edition of Visio, but nevertheless the appearance of Visio 2016 provided an opportunity to update the YaSM repository-add-in's that comes with the YaSM process model. Read the full article at Google+. Details: Visio add-in and Excel repository: How to manage the objects of the YaSM process model with a simple Excel spreadsheet. Greetings from Pfronten, Germany! 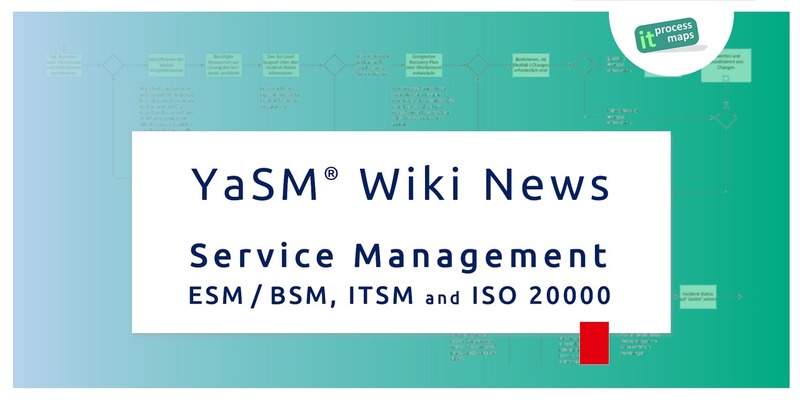 I'm Stefan Kempter and in my articles I write about YaSM, streamlined service management, ITSM, process templates and the YaSM service management wiki. I hope you find the articles useful! 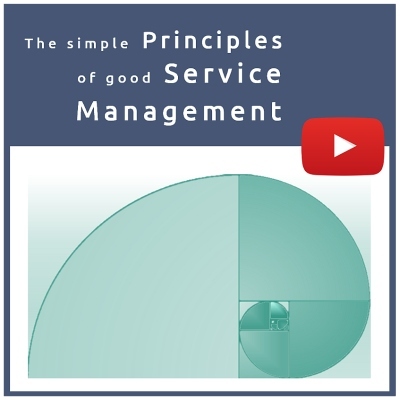 Service management explained - articles about YaSM. A process model with a complete set of process and document templates for organizations that want to get serious with introducing YaSM. Start the webinar (38 min. ): Understanding YaSM service management. Did you miss our event 'Why is there a need for YaSM?' This is a recording of the BrightTALK webinar that was held on January 21, 2015. YaSM® is definitely lighter than ITIL® (actually we decided to create the YaSM model because many of our customers looked for something lighter). But we don't want YaSM to be confused with what is often called "ITIL lite" or "lean ITIL" because we think the existing approaches are often flawed. From the YaSM blog: Is YaSM 'ITIL lite' or 'lean ITIL'? We have been running an ITIL®-Wiki in three languages for many years and received a lot of positive feedback. So setting up the YaSM Wiki was a natural thing to do once YaSM was ready to be launched. Read the article: Launch of the YaSM Wiki.